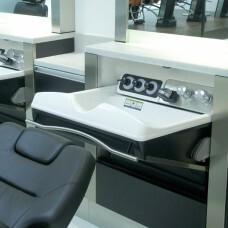 The Totally unique and stylish Salon Console fold-away basin system was created to allow for the optimum use of space as well as the practicality of a Shampoo basin. This system is perfect for VIP rooms, Barber’s shops, spas andmake-up rooms. The Salon Console is clean,neat, compact and ready for shampooing as and when required.There are three types of Console. The luxury type, custom type and G4.Prices are for illustration - you really need contact us to discuss your requirements.